Once you have practised spotting your colours in the shops, fashion shopping becomes a breeze. 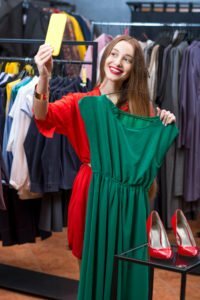 No more endless ruffling through rack after rack of clothing – not really knowing what you are looking for or which items you should pull out and try on. You can walk into a shop, scan through the racks of clothes and your colours will literally pop out at you, or not. You will know instantly if it’s worth spending time in a shop or moving on to the next one. However, fashion isn’t just about colour. It’s about style too. You can find an item of clothing which is a stunning colour and matches your seasonal palette but it doesn’t feel quite right when you try it on. The likely reason for this is that it isn’t the right style for your body shape. To ensure you look your fabulous best, we recommend teaming up a Colours consultation with a Styles consultation as well. Necklines e.g. round neck, v neck, polo neck, sweetheart neck, boat neck etc. Sleeve length e.g. ¾ sleeve, sleeveless etc. Sleeve type e.g. raglan sleeve, puffed sleeve etc. Most flattering waistlines e.g. high waist, drop waist etc. 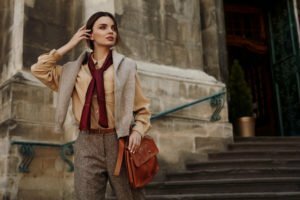 Building your wardrobe with the correct colours and styles means you can mix and match thus creating numerous different outfits. To help you with this, you will also receive a personalised Styles Wallet, tailored to your best styles, to help you when shopping.